Box 14-11. At 02:45 hrs, Rescue Squad 8 was dispatched as special service to assist on a shed fire in the 3000 block of Hooper Road (Box 10-14). Upon receiving further information, the address was updated to the 3000 block of Hoppers Delight Road (Box 14-11). The assignment was upgraded when it was determined to be a working fire and a Tanker Task Force was dispatched as well, sending Engine/Tanker 84 to the incident. A tanker dump site and fill site was established and a supply line relay was completed, while crews from multiple departments worked to extinguish the fire. The crew from Rescue Squad 8 assisted with overhaul and supply line break-down after the fire was extinguished, while Engine/Tanker 84 provided 4 tanks of water to the fire ground. 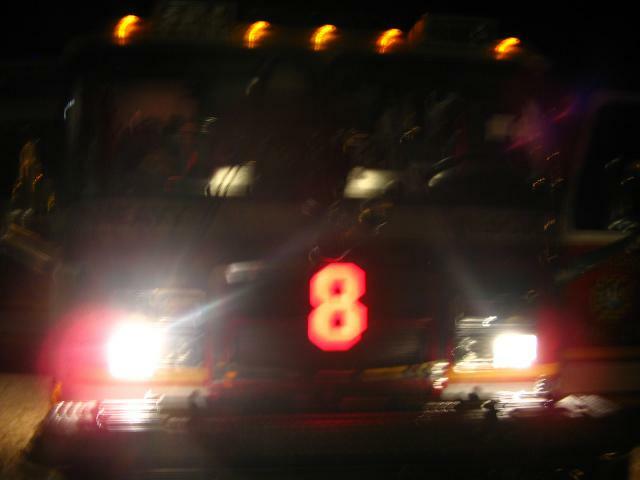 The incident is being investigated by the Maryland State Fire Marshal's Office. Station 8 units returned to service at 05:30 hrs.